Twenty years ago, in the aftermath of the Tiananmen massacre, numerous memorials, status, and other symbols of remembrance were established all around the world. Today, most of them have fell into disrepair or been ignored by the general public. But once a while, a local controversial might erupt on what to do with them. The latest happened within Boston's Chinatown. 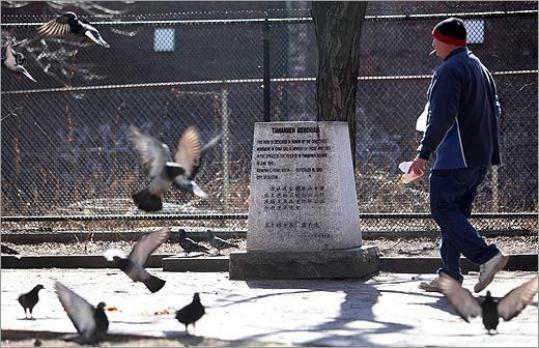 According to Boston Globe, The Mary Soo Hoo Park(aka, Chinatown Gateway Park), which hosts the memorial, is being renovated and some residents asked that the memorial to be removed so that the part could become "a place of repose, where adults can relax and children can play without the intrusion of politics." Other activists, of course, have other ideas. They questioned city designers repeatedly on the issue and insisted to preserve the memorial. A final decision has yet to be made.